Faster, better analytics. Business people can access data the instant it has been updated, without complicated and expensive replication and aggregation. Analytics can be embedded into operational processes without having to worry about data inconsistency because of time lags. Faster, better applications. Having a single system makes it easier to analyze, adjust, and optimize operational processes in real-time, rather than after things have gone wrong or opportunities have been missed. The opportunities are endless, from predictive maintenance to personalized, interactive offers for shoppers, or individualized medicine based on genome analysis. Lower costs. Yes, in-memory hardware remains more expensive than disk. But a single system for operations and analytics means reduced data duplication and manipulation costs. The result is a compelling business case even without the business benefits of faster decisions. Simplified application architectures. Most operational systems today require layers of cached data tables in order to provide acceptable performance. In-memory technologies eliminate the need for caches and aggregate tables, which in turn means a lot less code to write and maintain. More flexibility. Simplified architectures make it easier to update and adapt both analytic and operational systems. Changes can be carried out by tweaks to metadata rather than dumping, recalculating, and reloading large quantities of data. A ‘single source of truth’. This has long been a holy grail of the analytics industry. Businesses will always have to integrate data across multiple incompatible systems and decide common definitions for business concepts across the organization. In-memory HTAP systems make these tasks easier by reducing data duplication and allowing operational data governance in real time (data quality, master data management). The good news is that real-world HTAP applications are now available, with many more to come in 2015. As SAP co-founder Hasso Plattner has observed, the separation of transactional and analytical apps is unnatural. The practice became entrenched decades ago only because the technologies available at the time couldn’t handle both at once. Cloud, mobile, and in-memory capabilities are putting these worlds back together. The best current example of HTAP architecture in action is the recently announced SAP Simple Finance application. 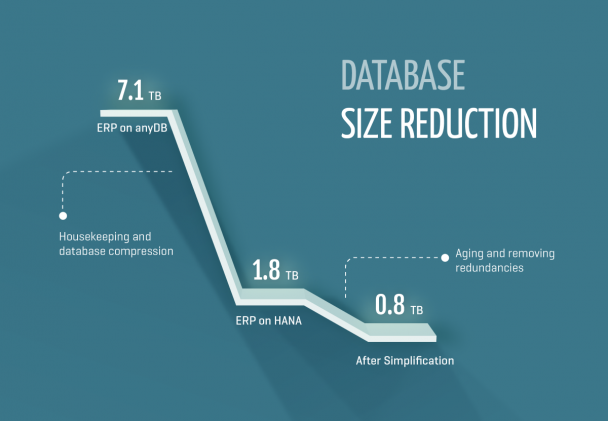 Because of the latency of traditional disk architectures, SAP Finance has up until now required hundreds of pre-calculated tables to ensure satisfactory levels of performance. SAP Simple Finance has just two core tables, instead of the hundreds in a traditional system. Thanks to the SAP HANA in-memory platform, SAP Simple Finance reduces this down to just two — one for storing transactions and one for storing metadata. This in turn means a dramatic fall in the amount of data the system needs to store, and because it runs in-memory, the system is fast enough to do every other type of calculation on the fly. The result is the best of both worlds: a simpler, cheaper, more robust system that still manages to provide better performance and more flexibility (see this post for more technical details). CFOs can see the state of the business right now, not just at the end of the quarter. And it’s easy to get a different view of the business at any time — for example, seeing what the accounts would look like with a different sales or product hierarchy is as easy as changing some metadata. Some business application vendors have tried to provide better analytics for business applications by adding another layer of in-memory processing — making the system even MORE complex. It’s time to get rid of the unnatural separation of transactions and analytics, and time to stop unnecessarily storing endless duplicates of core data: the future of business application is simple.